Powdery mildew, caused by Blumeria graminis f. sp. tritici, is the most common foliar disease of wheat in Ohio. It is most damaging in years with relatively mild weather during April and May. Mild temperatures, high relative humidity and dense stands of wheat favor powdery mildew development. It is most prevalent on the lower leaves of susceptible varieties in late April or early May when wheat is in the joint to flag-leaf stage of development. This disease impacts grain yield by reducing the number of heads, and kernel size and weight. Young tillers may even fail to produce heads. The earlier in the spring mildew begins to develop on the plant and the higher on the plant it develops by flowering, the greater the yield loss. Greatest yield losses occur when the flag leaf becomes severely diseased by heading. Losses of up to 45 percent have been documented in Ohio on susceptible varieties when plants are infected in April and cool weather conditions favor the spread of the fungus throughout the growing season. Fig. 1. A, Powdery mildew on wheat leaves. Insert (B) showing new (white) and old (gray) pustules side-by-side. Fig. 2. A, Whitish-gray powdery mildew pustules on a lower leaf showing dark dots (fruiting bodies; cleistothecia). The insert (B) shows a close-up of a cleistothecium. Powdery mildew is characterized by a powdery white to gray fungal growth on leaves, stems and heads (Fig. 1). The fluffy white pustules are first detected on the lowest leaves of plants in early- to mid-April. As the plant matures, the white powdery growth changes to a grey-brown color. The leaf tissue on the opposite side of the leaf from the white mold growth becomes yellow, later turning tan or brown. Small, black fruiting bodies (cleistothecia) develop on leaves as plants mature in June. Cleistothecia are recognized as distinct round, black dots within older, grey colonies of powdery mildew (Fig. 2). Cleistothecia contain spores (ascospores) that serve to infect in the fall and early spring. Wheat plants are most susceptible during periods of rapid growth, especially between the stem elongation and heading growth stages. 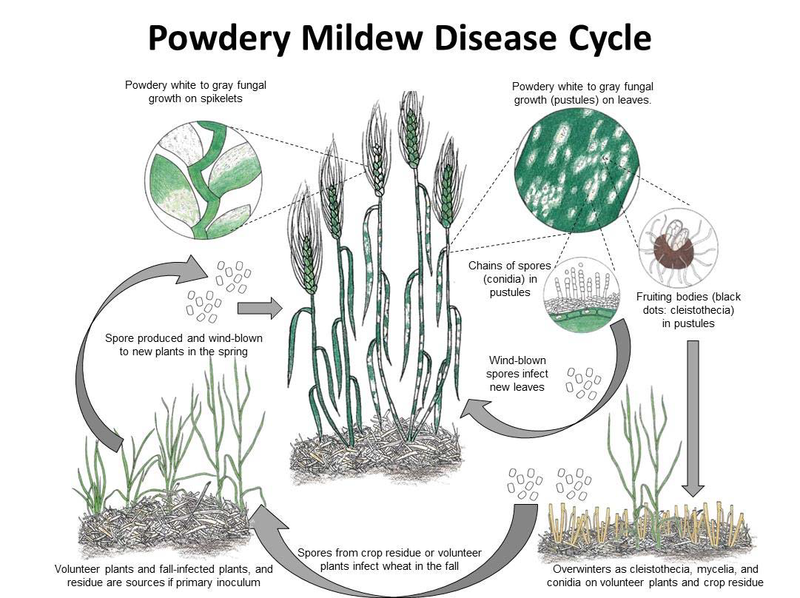 However, in most years, wheat becomes infected with powdery mildew in the fall soon after planting, but these early infections are generally not easy to detect. Autumn infections result from spores produced on volunteer wheat plants or in cleistothecia on crop residue. 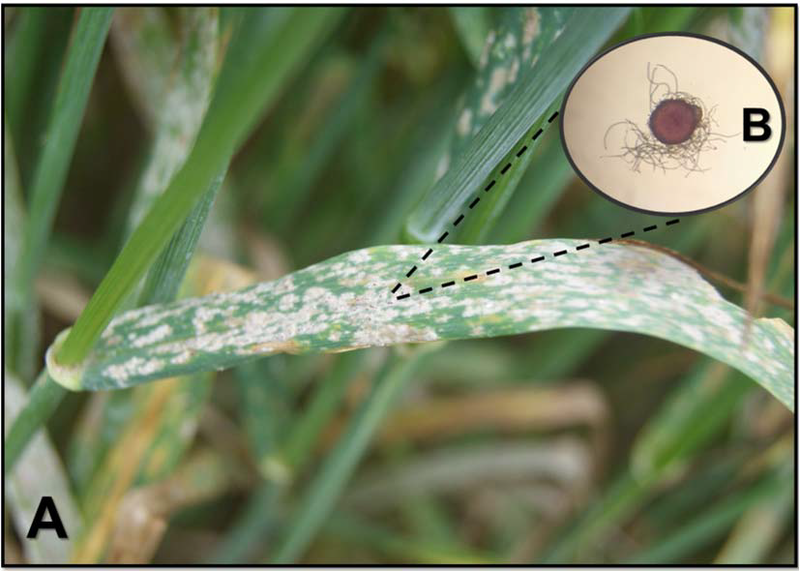 The mildew fungus survives the winter as cleistothecia on wheat straw or as mycelium on infected wheat. Spores germinate and infect plants under cool, humid conditions. Infection does not require free water on the plant surfaces, but high relative humidity (near 100 percent) favors infection. Optimum development of powdery mildew occurs between 59 and 71 degrees F and is retarded by temperatures above 77 degrees F. Mildew is more severe in dense stands of heavily fertilized wheat. Under optimum conditions, a new crop of conidia is produced every 7 to 10 days. Conidia are wind dispersed to new leaves, causing the disease to spread up the plant and between plants. As temperatures increase late in the season and the plant and fungus age, new cleistothecia are produced. Planting mildew resistant varieties is the most economical way to control powdery mildew. Wheat varieties vary in their resistance to powdery mildew and new races of the fungus develop that attack previously resistant varieties. Therefore, it is important to get current information on the varieties with effective resistance to powdery mildew. 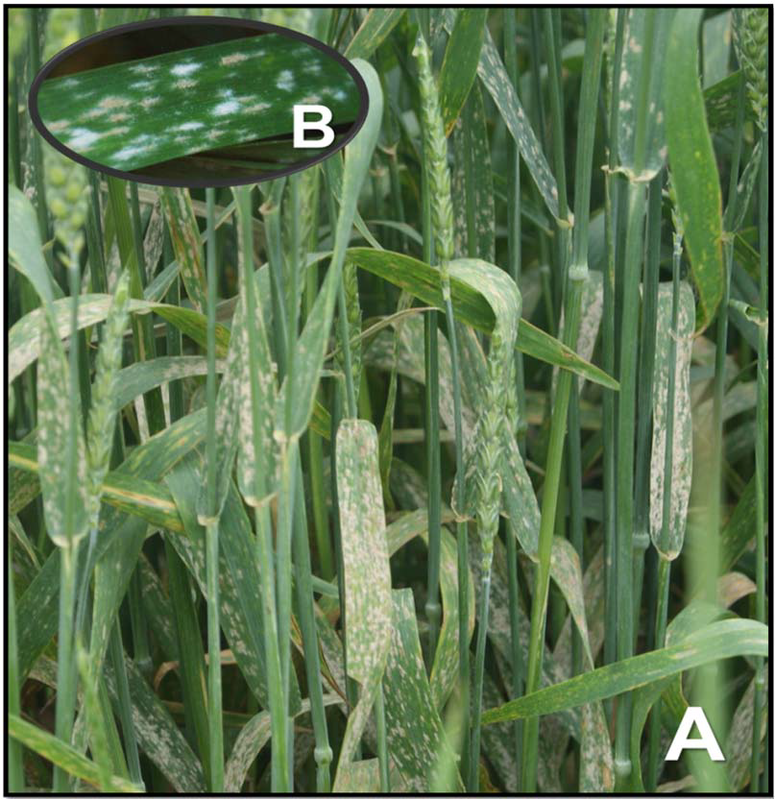 Powdery mildew thrives in fields with high rates of nitrogen. Nitrogen not only promotes tiller formation, causing dense stands, but also increases the susceptibility of the crop. Use a balanced fertilization program with proper levels of N, P and K. Watch for mildew in fields receiving greater than 70 lb N/A. In fields with persistent disease problems, the wheat stubble and other residues should be tilled into the soil to permit disease causing fungi to die out before another wheat crop is planted. Incorporating wheat residues into the soil, destroying volunteer wheat and crop rotation will reduce the amount of overwintering inoculum in the field. Fungicides are available that provide excellent control of powdery mildew. Their application is based on scouting fields for symptoms and assessing disease severity from tiller elongation through flowering stages of growth. It is important to keep the top two leaves of the plant as disease free as possible during grain fill. Fungicides can be applied based on the level of disease in the field, the known susceptibility of the variety, and the market price of the grain.